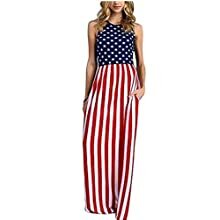 American flag print, sleeveless and high waist design, casual and unique, perfect for celebrating the Independence Day. Suitable for daily wear, party, parade, etc. 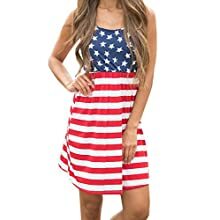 PATRIOTIC DESIGN: Nothing says you love your country more than wearing an American flag dress, and because it’s one of the best casual dress this year for women you can showcase it around the world. 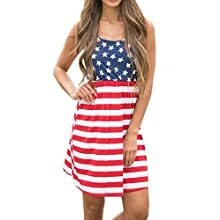 SLIM FITTING: When you’re daily casual in the street or at the beach you want to show your elegance and enthusiasm perfectly, which the American dress offer due to their slim fit perfect for all body shapes and your temperament.